Chengdu “…the dragon of China is rising” | Realise the World! Chengdu marks the halfway point of the Tour. So far over 3,000 seekers have received their Self Realisation. It has been some thing unique and extraordinary to see the power of Shri Mataji reaching out to all the corners of the world, whatever road we tread in Her name, Shri Mataji is always there before us guiding and inspiring, ever leading us on. 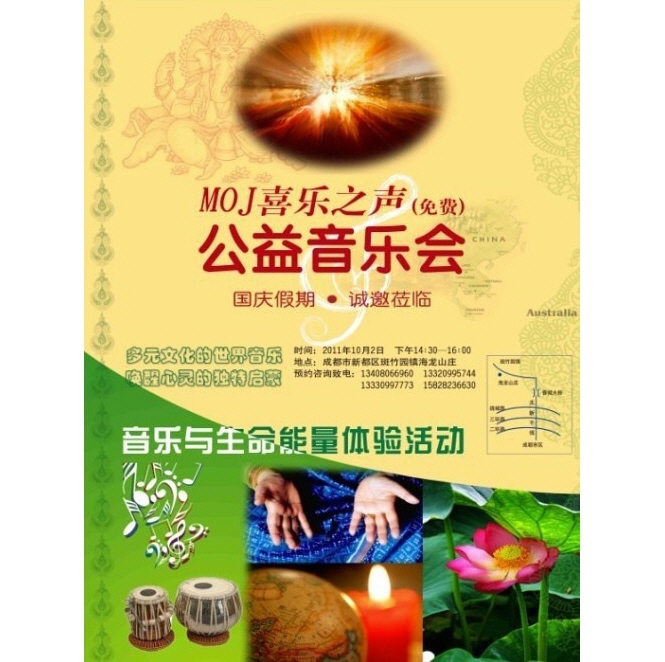 The Chengdu program coincided with the hosting of the 17th Sahaja Yoga National China seminar. There are two National seminars held each year in China. This year over 500 Yogis attended the seminar with representation also from collectives of Taiwan, Malaysia, Singapore and Australia. The seminar’s theme was ‘Going Deeper’ with sessions on string burning, exchanging vibrations, talks on clearing the subtle system and many deep collective meditations. The first evening, a beautiful Havan was hosted outside under the star lite night skies, the weather warm and beautiful, sitting on the earth , taking our Mother’s names of Mahakali. A very deep experience. The next morning was a 6am rise for morning meditation followed by a Shri Mataji’s Navaratri video. A short break, then a collective shoebeat. The morning sessions was devoted to discussions on the Deities followed by a time when stories were related of personal encounters with Shri Mataji. Many of the Yogis of China have never met Shri Mataji, so they are very keen and always eager to hear accounts of what it was like to be with Shri Mataji. Anand’s (Shri Mataji’s grandson) stories were very much appreciated, and they were very happy to met with him. The Chengdu public program was again very well attended with 1,000 people attending an open air concert. Our first outdoor concert program surrounded by nature. It was refreshing, to be surrounded by trees, a fresh breeze stirring the air, sitting under an open sky. The program again featured Self Realisation with all the Chinese seekers receiving their Realisation. Wonderful happy times shared with brothers and sisters. The spirit of India Tours of old has been reborn for us all and how glad and happy we all are to be reliving some of the best days of our life. The fun and jokes while travelling, laughter and happiness fill our days Touring again, as we did with Shri Mataji. We feel Her ever much with us. It is said a picture tells a thousand words and the images of all the seekers at Chengdu with their hands above their Sahasraras feeling their Kundalini is one of those experiences which is timeless, spiritually fulfilling and joyful. The dragon of China is rising and awakening at the spiritual level, great days are before us, thousands are receiving their awakening and coming to Our Mother, these are the Sahaj events of our times where our attention is most needed. 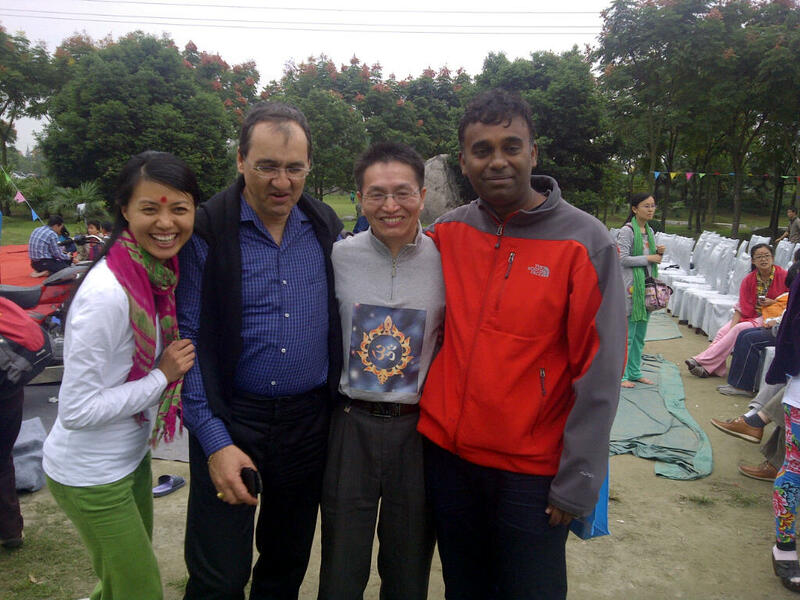 There is Yogi from Shengzhou called Frank (in the photograph he is positioned next to Anand) who has given Realisation to 10,000 people. Frank works as a management consultant and trainer and gives all his classes their Realisation, sometimes up to 1,000 a day When you spread Sahaja and see new seekers come to Shri Mataji then, as a Yogi, we truly feel that surrender to the will of God, the inner desire to be totally devoted to the discipline of the Divine work of God, which can move mountains, and miracles daily fill our life daily. Shri Mataji asked that we uphold Her vision as living confirmation and attestation of Her Divine truth and to pass on the God’s liberation of Self Realisation to all seekers of all countries. There are many beautiful innocent seekers in China. We are being constantly thanked for coming to China, but without a doubt we are receiving an infinite amount more of blessings, love and renewed hope that is reinvigorating that passion we all shared when we first came to Sahaja Yoga. You can see that renewed light of hope illuminating everyone’s faces. Sahaja Yogis have some idea of where we are destined because of where we have been, and the Divine love we have known and felt in our hearts. In brotherhood and sisterhood, we are reaching out to China to pass on and share that unique love we have been gifted to others such as ourselves who are also searching for meaning and fulfillment in life. Wonderful, inspiring news and very important for this awakening to be happening now in China at this time. JSM, to all brothers and sisters of China. May Mother give u all strength to spread more…and attain more ascent.